The Speed is back—sort of. In its original, 2005 edition, Black Diamond's Speed backpack was a masterpiece of light-is-right design. The original, 30-liter Speed backpack gave us a floating lid, side compression straps, a stiff single-stay frame, and not much else. For fast travel with heavy loads, the pack was and is just about perfect. Big ski mountaineering day trips? Check. Desert hikes that demand a gallon of water? Check again. I like my old 2005 Speed backpack so much I still use it. The fact that I am nursing a battered ten year old backpack, however, should tell you something about my opinion of the Speed's successors. Let's not mince words—they all sucked. The packs got heavier, the frames got softer, and then to add insult to injury, Black Diamond became entranced with its 'ReACTIV' suspension, forcing pivoting waistbelts and shoulder straps on virtually the entire line. ReACTIV, with its debatable bells-and-whistles approach to load leveling, never made sense for the Speed family, which were originally conceived as ultralight, stripped-down climbing packs. ReACTIV suspensions continue to be found in today's Speed models, with the exception of the interesting new Speed 22, which—to a degree—returns to the original Speed's ethos. Once again, we have a very simple pack with a floating lid and side compression straps. No, there is no stay, or otherwise rigid frame. The Speed 22 has a softish foam insert along the backpanel that adds structure. It is very light, at one pound six ounces, and falls short to the original only when it comes to bearing heavier loads. Skiers will like the A-frame carry option enabled by the robust side compression straps. 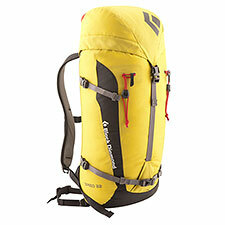 For a pack with a soft suspension, the Speed 22 does a passably good job carrying weight. No doubt, the string-and-bones waistbelt is the weak link here, tending to just squeeze your stomach rather than distribute weight to hips. In this day and age of 'AirSpace' designs, the Speed 22 is very much Old School, fitting close against your back, with no effective ventilation. It does tend to heat up, reducing its appeal for warm and hot weather hiking. That said, the joys of a daypack with a floating lid are hard to overstate, especially if you're trying to bring extra clothing, or food, or climbing or photography gear. What is best about the Speed 22 is that it is simple. Simplicity was the hallmark of the original Speed concept, and we've only had to wait ten years for simplicity to return. I say the waistbelt is a limiting factor for 24-hour marathon carries, but aside from that warning, this is a fine extended use daypack, well worth investigating for climbers and skiers alike.